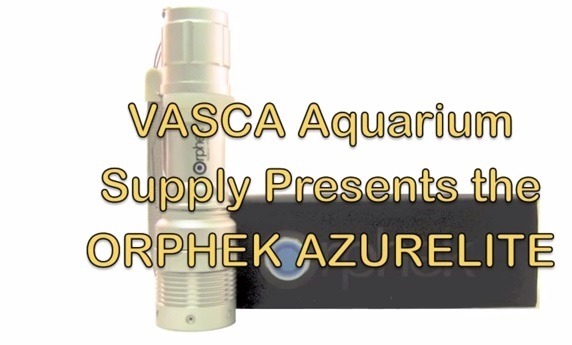 The Orphek Azurelite 5 Watt LED Flashlight is an indispensable tool for multiple purposes. 1) You can use it to view corals and stomatellas, mysis shrimp, amphipods, bristelworms and other creatures moving around your tank at night when the main tank light is turned off. 2) For brilliant illumination and the fluorescing of corals for photography. 3) To assist feeding corals at night—illuminate the coral you’re feeding without causing the polyps to close up. Plus, there is a strobe to create lighting mode! MarineAndReef.com (aka The Aquatic Group) has been selling aquarium products on the Internet since 1998 and is located in beautiful Tempe, Arizona. We carry a wide variety of aquarium products. We don’t have dog or cat products, the latest John Grisham bestseller or the Xbox. But we do have over 5,000 aquarium products. We specialize in a couple areas. We’re more oriented toward saltwater than freshwater and we carry a very wide selection of replacement parts. Many manufacturers send their parts customers to our Web site. We believe that aquarists should not throw away their products because they can’t get a simple replacement part. We try our best to keep our prices low while keeping our customer service first rate. Everyone answering your phone calls and Emails at MarineAndReef.com has an extensive knowledge of the products we sell. This is not true of the many companies out there who sell the dog treats and catnip, or who sell that latest John Grisham novel. Try calling that big company named after a certain river and ask them to identify the correct replacement impeller for your canister filter. It could be a very interesting phone call. Conversely, if you want to talk about the latest John Grisham novel we’re happy to oblige. Keep in mind, we only work Monday through Friday from 8AM to 4PM and we break for lunch from 11:30 to 12:30 (we’re on Arizona time). This insures that whoever you talk to will not be munching on a sandwich. If you read through the reviews, you’ll see we have a reputation for shipping orders quickly and packing products securely. We do our best to ship orders the day we receive the order and we ship through the company (USPS, FedEx, UPS) that will get the product to you the quickest. You’ll also see from the reviews that when problems do arise we make things right with our customers. We can’t say that 100% of our customers are satisfied, but we will do whatever is reasonable to make a customer happy. LOCATION: Our shipping warehouse and mailing address is 1536 W. Todd A102, Tempe, AZ 85283. Unfortunately, we are not open for customer pickup or drop off. All products must be shipped to the customer and all returns must be shipped to us. EMAIL: Please Email us at sales@marineandreef.com with any questions you have. PHONE: We can be reached M-F 8AM-11:30AM & 12:30PM-4PM (Mountain Time–Note: we do not have daylight savings time in Arizona) at toll free 877.878.9349 (1.480.491.5283 from outside the United States). For the best possible customer service, please identify yourself as a Marineandreef.com customer so the customer service representative can look at the same Web site you’re looking at (we have four retail Web sites, but only one phone number).